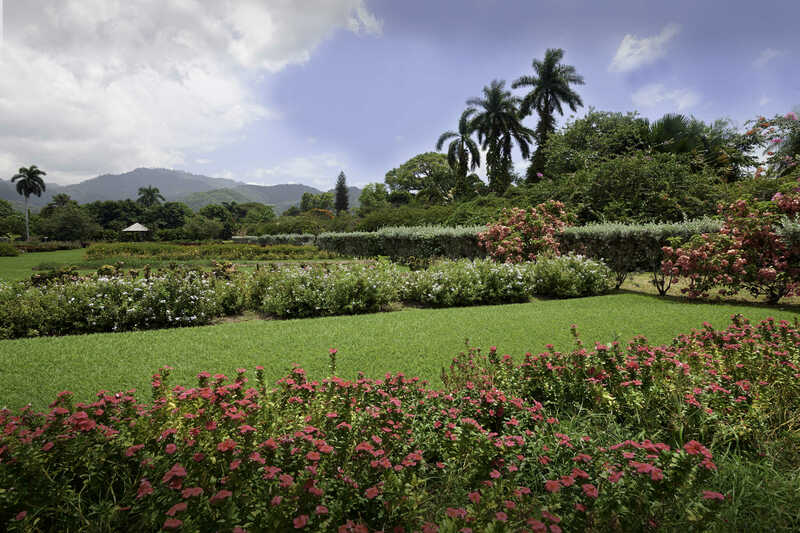 The Royal Botanical Gardens sits on over 200 acres of beautifully manicured lawns and is home to many of Jamaica’s endemic birds and plants. Hold your ceremony by the Sunken Gardens and then venture out to capture memories by the lilly pond. Take a walk down the bougainvillea avenue with its explosion of tropical colours and snap photographs amidst some of our rarest and exotic tropical flora. Mosey on over to the Kingston Zoo which sits on the property that will be sure to add that wild safari adventure to your day. St. Thomas is a parish not popular with tourists and it is for this reason that you’ll love it. 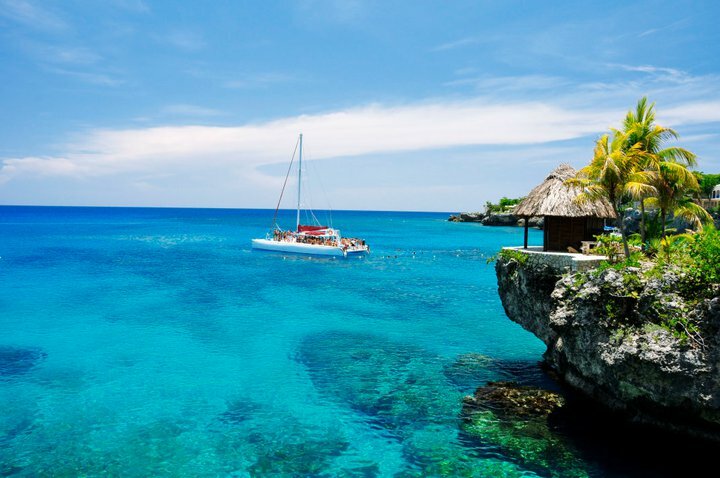 Lush, pristine scenery, untouched and green, facing the South-Eastern edge of the island embraces you with the true charm of Jamaica’s warm beauty and culture. The Whispering Cove will help you to pull-off your secluded beachfront wedding wishes and then whisk you off to nearby popular destinations in Kingston or Portland, such as the natural wonder that is Frenchman’s Cove. Whispering white sands graced with both warm salt waters from the Caribbean Sea and more refreshing waters from the river’s edge, this delightful property surrounded by lush botanical gardens boasts the best of several worlds. Whether you’ve always dreamed of a garden wedding surrounded by nature’s best or a beach wedding on calm Caribbean waters, Frenchman’s Cove offers it all. 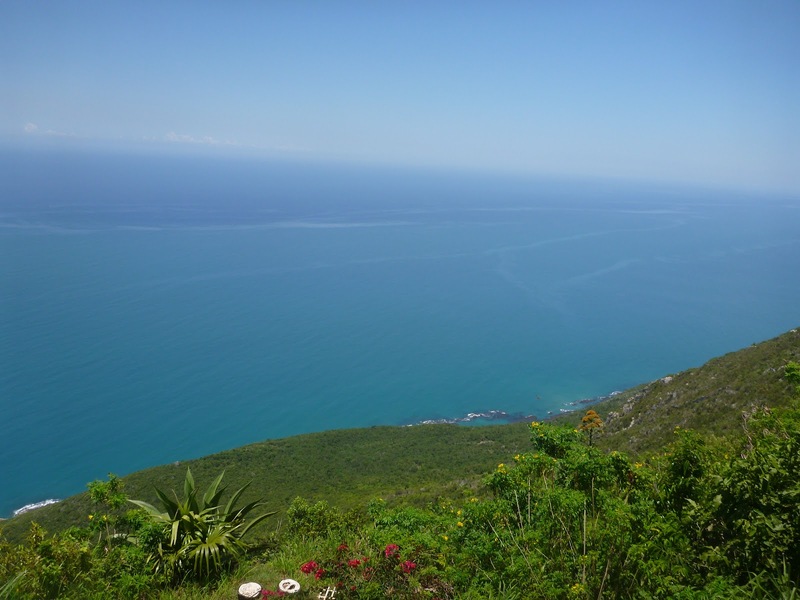 Imagine a place rich with pirate and celebrity history perched atop mountains overlooking the Caribbean Sea. Celebrated British playwright Noel Coward’s last home Firefly is entrenched in such whimsical culture. Coward hosted many dignitaries at Firefly including, Queen Elizabeth II, the Queen Mother, Sir Laurence Olivier, Winston Churchill, Elizabeth Taylor, Richard Burton, Peter O’Toole, Sophia Lauren, Alec Guinness. He also entertained his neighbors Ian Fleming, Errol Flynn and Ruth Bryan Owen. Now, you can host your friends and family here for your own wedding overlooking the Blue Harbour. 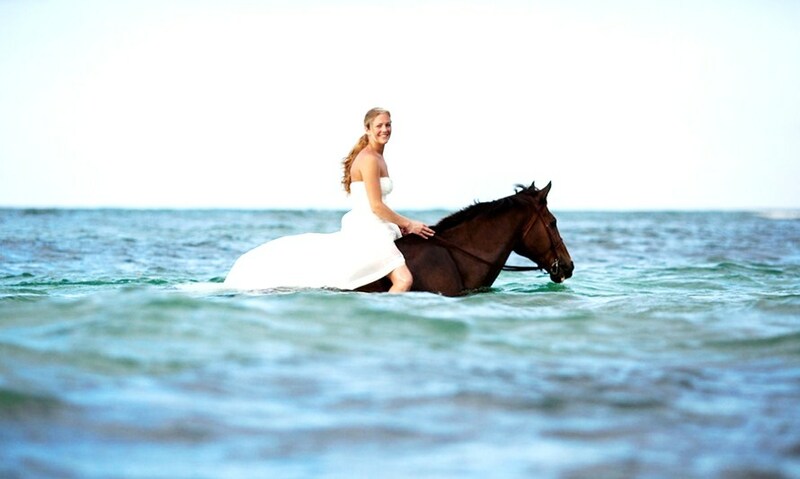 St. Ann offers up many options for the destination bride from getting married atop horses riding through the turquoise shores to the golden sands of its world famous beaches to the backdrop of Dunn’s River Falls. 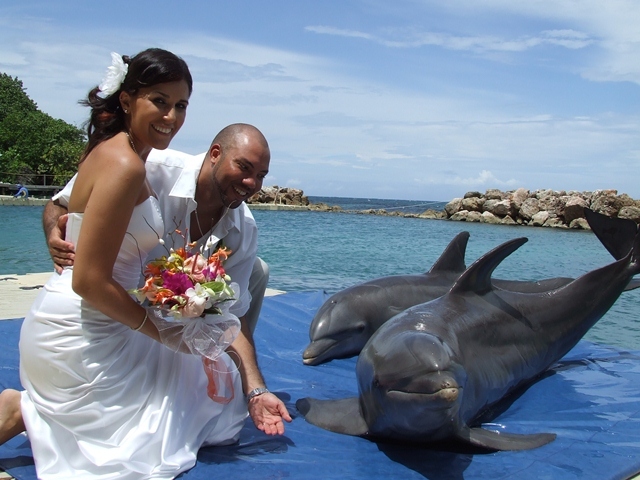 Perhaps the most exhilarating is the wedding package at Mystic Mountain complete with vows 700ft above sea level on their Skylift ride and maybe the cutest on the list is to be found at Dolphin Cove where the adorable guests of honour play ring bearers. Be careful, they will steal your bride with a kiss! 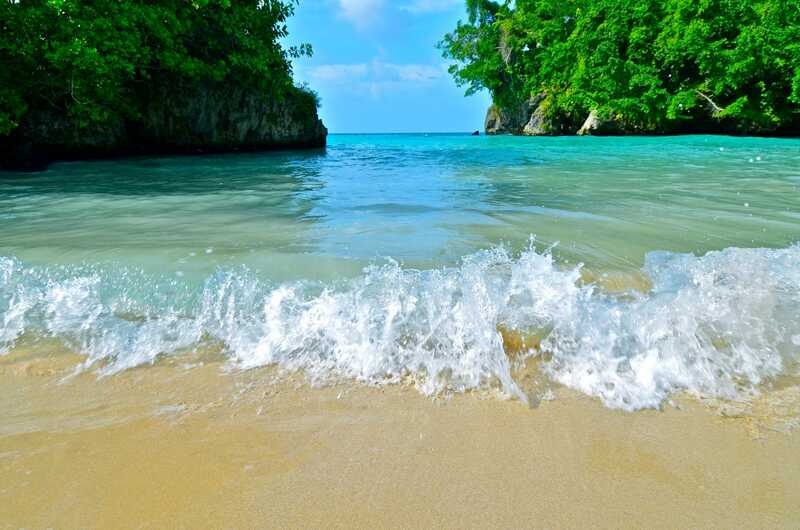 If Ocho Rios is known for the golden sands then Trelawny is home of the silver. Crystal white sands sparkle in the sunlight with the clearest, bluest seas this side of town. Still serene and untouched, Silver Sands offers romance on the seas for a dream tropical wedding. 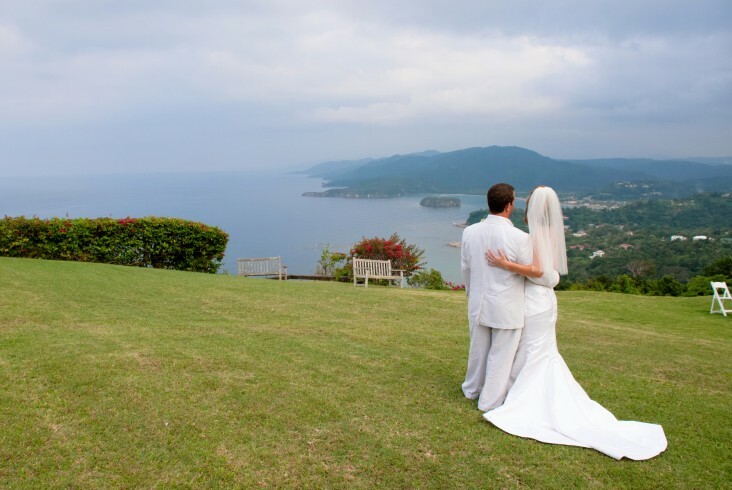 Like St. Ann, St. James offers the visitor to Jamaica many picturesque options for wedding locations from luxury all-inclusive hotels on sprawling white sand beaches to first class conference center grounds to cool and natural mountainside lodgings. The choices are many so we’ve highlighted the Sandals Royal Caribbean property to make everything easier. With its own private island accessible only by boat, the adventure is as fun and as exciting as your imagination can run wild. Book a catamaran sunset cruise and sail off into the horizon with your guests as you say I Do to the backdrop of the island’s best sunset location. On the very most western end of the island, the sunsets here are unmatched and will envelope you and your guests. 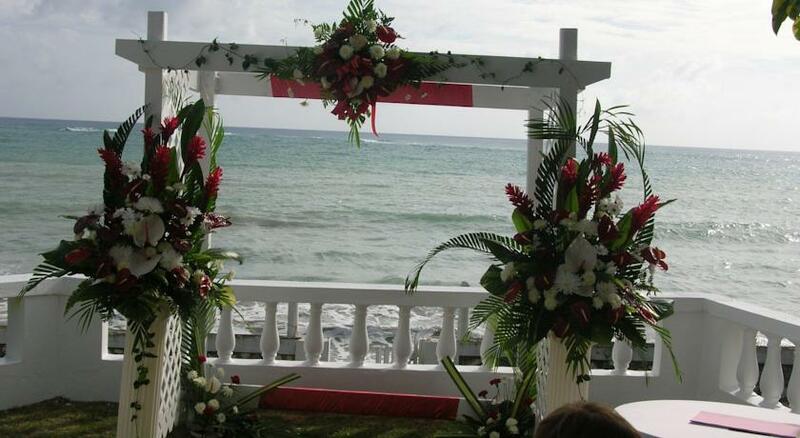 Get married on the western most tip of Jamaica to the most spectacular sunsets on the island. The choice of many a barefoot beach wedding, but the cliffs and azure waters below create the perfect setting for an equally memorable wedding day. In our own Romeo and Juliet type story, legend has it that during the days of enslavement two young lovers used to meet secretly on the adjoining Yardley Chase Plantation. The owner wanted the female for himself and arranged to have her lover sold. Not wanting to be separated, the two hand in hand plunged to their death off the 1700ft cliff. The views are spectacularly breathtaking and the history of the location will add mystery and charm.